G4G is a 12 week programme incorporating coaching sessions with fun non-competitive blitzes aimed at increasing participation in Ladies Gaelic Football. 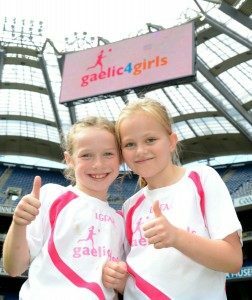 The programme targets girls aged between 8-12 years who are not currently registered with a Ladies Gaelic Football club. In essence, this is a tool to attract new players. 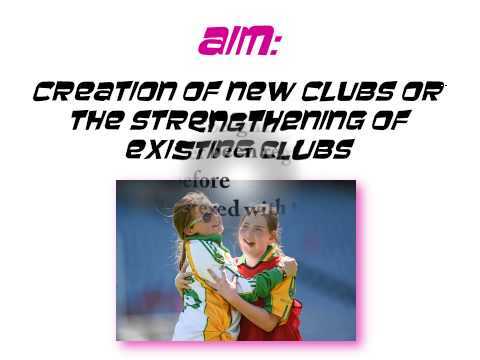 What are the aims of the Gaelic4Girls Programme? To increase the numbers of girls playing Ladies Gaelic football in a club. To provide a fun, 12 week programme of Ladies Gaelic Football activities to attract girls aged 8-12 to the club. To support a club in increasing their number of players, and integrate those new players into existing teams. To develop athletic and social skills for girls in a safe and nurturing environment. Participation levels will be increased. Free training will be provided to the Coaches and Co-ordinator in your Club. Resources will be provided to your Club to market and advertise the Programme. There is the potential for your Club to become a more vibrant, active part of your local community through enhanced participation. What does the G4G programme entail for your Club if your application is successful? The Club must be able to provide a co-ordinator and a minimum of 1 coach per 10 participants to run the Programme. Minimum of 2 coaches per Programme. All the G4G coaches and co-ordinators must attend Provincial training. The Club must be willing to welcome ALL new members. The coordinators will be provided with marketing materials e.g. flyers, posters and the Club must use this material to promote the Programme in the schools and elsewhere. The first 8 weeks of the Programme will involve weekly coaching sessions separate to the regular U10/12/14 sessions in the Club, specifically designed for those who have not participated before. The last 4 weeks will involve integrated training sessions of all players with the above teams, as a means of integrating the G4G participants into the Club. A Mini Blitz may be available after 8 weeks (numbers dependent). A Provincial Blitz will be available after 12 weeks (approx). The Programme will cost €10 per player to cover the cost of promotional material and a programme specific T- shirt for each G4G participant. Clubs must participate in a Ready Steady Coach workshop during the programme. This workshop is aimed at providing support and assistance to new volunteers interested in helping with coaching or running a team within the Club. It is a 2 ½ hour course. The Club must monitor the integration of the G4G participants and ensure all those who want to continue to play Ladies Gaelic Football are registered and looked after. Applications will RE-OPEN for the 2019 Programme in December. You need to complete the application form which will appear below and forward by post or email to your Provincial Development Officer. The County Development Officer, following consultation with the Provincial Development Officer and National Development Team will contact all applicants via e-mail to announce the successful clubs. All G4G coaches and coordinators must attend Provincial training in March. All clubs must promote the G4G programme in their local area. The 4 week integrated sessions will follow straight after. A Provincial Blitz will be available after 12 weeks approx. The clubs will have an opportunity to participate in a Provincial Blitz (dates to be confirmed).